Get to know the motion picture location scouting companies and real estate agencies using unmanned drones for aerial shoots in California–much to the chagrin of the FAA, the LAPD, and an agency representing crane operators. Each and every one of us is living in a sci-fi novel, and this spills into real life into a million different ways … like the way that Hollywood location scouts and real estate agents now routinely use unmanned drone aircraft. Unmanned aerial vehicles (UAVs) have gone from military operations in Iraq and Afghanistan to simply becoming a routine movie industry tool. The FAA isn’t too sure about how to deal with the drones of Hollywood. And neither is the LAPD. This past January, the Los Angeles Police Department issued a highly unusual warning against the use of drones by real estate agencies. The LAPD sent a letter to the California Association of Realtors, a trade group, warning that Realtors “who hire unmanned aircraft operators to take aerial photographs for marketing high-end properties” were in violation of FAA rules and local motion picture filming ordinances. Users were warned that the LAPD’s Air Division intends to prosecute violators in the near future. However, the letter appears to be hot air: Unmanned aircraft flying at heights under 400 feet are currently unregulated by the FAA. What makes the letter even more interesting is that it was written on behalf of FilmL.A., a private corporation that serves as a public-private liaison between the motion picture industry and local government. FilmL.A., which is largely responsible for issuing filming permits, was founded as a result of Los Angeles City and County’s privatization of their film permit offices. Amateur UAV aficionados have noted that filming via UAV does not require the costs incurred via a conventional film permit. In addition, FilmL.A. represents crane operators, who have a vested interest in restricting UAV use for motion pictures. Meanwhile, drone filming for real estate and location scouting continues unabated. Boutique drone firm HeliMalibu specializes in photography and video of luxury real estate properties via drone aircraft. HeliMalibu uses a custom multirotor UAV which is equipped with multiple cameras and flies autonomously. The drone, which looks like an H.R. Giger helicopter, has filmed many of Los Angeles’ ritzier neighborhoods. According to The Hollywood Reporter‘s Daniel Miller, HeliMalibu’s services were used to sell the Bel-Air home of ex-Architectural Digest owner Bud Knapp, along with the Holmby Hills residence of Paramount CEO Brad Grey. HeliMalibu also provides services to the feature film industry, such as filming car races. California-based Air Drone Productions, which advertises its work on reality show Gene Simmons’ Family Jewels and Disney’s Road Dogs, has a 45-minute battery life “Cinema Flyer” UAV drone aimed the film industry. The drone has multiple camera setups and a one-mile video transmission range. UAV manufacturer DraganFly produces a series of UAVs aimed at the real estate and motion picture industries. The UAVs, which feature a variety of camera configurations, can be custom designed for wildlife photography, news media, property assessments, and location scouting. DraganFly’s UAV is on the small side (think of a camera-equipped remote control helicopter on steroids) and designed to both fly into tight spaces and hover in midair. Another manufacturer, German firm DroidAir, specifically targets the motion picture industry. The company’s flagship product, the $6,500 DroidOne, is manufactured in China and targeted at both the European motion picture industry and police departments. Their drone is custom-designed for a stable camera mount and has a half-hour flight range. 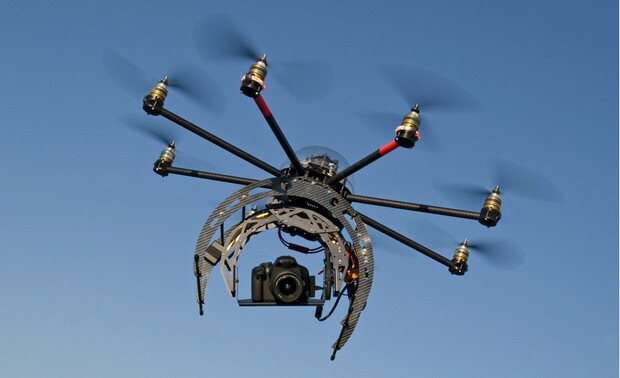 The FAA has sporadically persecuted firms engaged in filming via UAV. One company, MI6 Films, which provides commercial aerial filming services, was apparently issued a spoken cease and desist order by the FAA. Users on industry bulletin boards have also reported similar troubles. For UAV operators, however, domestic drone use is poorly regulated, and the possibilities are hypothetically unlimited. Drones that perch on building ledges can be used by private detectives and crusading magazines/blogs alike. UAVs mounted with cameras for low-flying aerial use can just as easily be used by legal forensic teams or location scouts trying to figure out the next Law and Order spinoff. FAA regulations for commercial, non-military or police drones are widely expected to be issued this year. Informed observers believe the FAA will formally approve six U.S. test sites where drones can share airspace with other traffic without the need for special permits. That strange new sci-fi world of camera-equipped, pilotless planes swooping through the air? It’s here.